Employers of all sizes in California will need to ramp up their sexual harassment prevention training in 2019, thanks to a new law signed by Governor Jerry Brown. Brown signed SB 1343, a bill that adds new requirements for Sexual Harassment Training into law, on September 30th, 2018. Currently, only employers with 50 or more employees are required to offer any form of sexual harassment training, and it’s only necessary for employees in a supervisory position. With the passing of SB 1343, employers with at least five employees will be required to provide sexual harassment prevention training and education to both supervisory and non-supervisory employees employees in California by January 1, 2020. SB 1343 requires employers with five or more employees, including seasonal and temporary staff, to provide sexual harassment training and education every two years. Sexual harassment training requirements have been in place for California employers since 2005, but have always been geared towards larger employers and only for supervisory staff, which make up approximately 25% of the workforce. 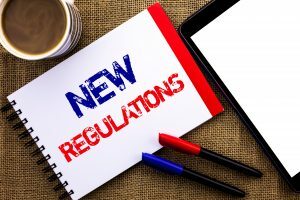 In order to be compliant by the January 1, 2020 deadline, employers of all sizes will need to increase their efforts to train and educate 100% of their workers at some point in 2019. The new law also creates requirements for the California Department of Fair Employment and Housing (DFEH), explained below. By January 1, 2020, employers with at least five employees must provide: (1) at least two hours of sexual harassment prevention training to all supervisory employees; and (2) at least one hour of sexual harassment prevention training to all non-supervisory employees in California; within six months of employees assuming their position, and once every two years thereafter. Employers must also provide sexual harassment prevention training to temporary or seasonal employees within 30 calendar days after their hire date or within 100 hours worked if the employee has been hired to work for less than six months. In the case of a temporary employee employed by a temporary services employer such as a staffing agency or temp agency, the training must be provided by the temporary services employer, not the worksite employer. Training may be conducted with other employees as a group, or individually, and may also be broken up into shorter time segments as needed, as long as the complete two-hour requirement for supervisory employees and one-hour requirement for non-supervisory employees is met. The DFEH will develop, obtain, and make available one-hour and two-hour anti-sexual harassment training courses for supervisory and non-supervisory employees. Employers will be permitted to develop their own training platforms, as long as they comply with the law’s requirements. Employers should plan to conduct all training to all current employees between January 1st 2019 and December 31st 2019 to be compliant with the January 1st 2020 deadline. Any employees hired after the deadline will need to participate in the training within six months of their hiring, or within 30 days/100 hours for temporary/seasonal.